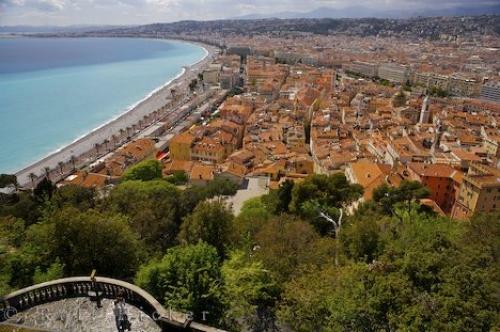 Panoramic view of the Old Town of Nice from the Parc du Chateau in Nice, Provence in France, Europe. There are many things to do in Nice, Provence in France but one that should be at the top of the list is a visit to the Parc du Chateau for the spectacular view. The Chateau, itself has been gone since 1706. Nowadays, Le Chateau refers to the 92 meter hill that towers above the city of Nice in France. The Parc du Chateau is located on top of the hill and there is a playground for children to have fun, many flowers and shady walks through the trees. An artificial waterfall built in the 18th century and ruins of the 11th century castle are the historical reminders. Photo of Nice from the Parc du Chateau in Provence, France in Europe. I photographed this photo with the digital SLR camera model Canon EOS-1Ds Mark II, aperture of f/6.3, exposure time of 1/160 sec. on ISO 100, as always I used a original Canon Lens, the focus lenght for this picture was 24mm.